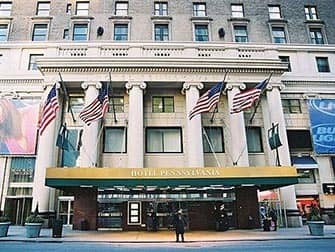 Pennsylvania Hotel in New York is a great hotel if you want to be in the centre of Midtown and you are on a budget. Rooms are ok and kept tidy (the higher up, the better). However, it’s the location that makes all the difference at this hotel and makes it such good value for money. 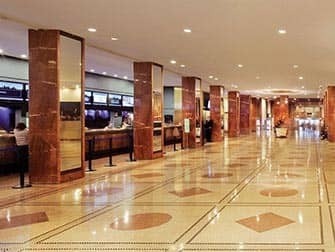 The hotel lobby is always busy, filled with guests, which adds to the New York atmosphere. 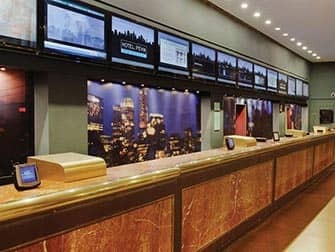 The staff at Hotel Pennsylvania are multilingual and more than happy to help with any questions you may have. 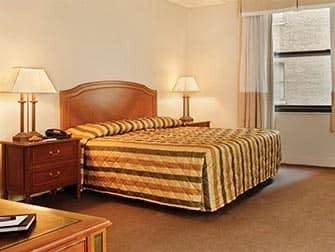 The hotel understands that you would like to maximise your time in New York and does its best to accommodate this. When checking out, you can make use of the express checkout and the luggage storage, which is really handy if you have a later flight. The rooms at Hotel Pennsylvania are neat and tidy. They are on the simple side but fine if you don’t plan on spending too much time inside. The beds are firm, yet comfortable and the bathroom, small but clean. Because of the location, you will probably hear the noises of the big city, but this shouldn’t be too bad late at night. The hotel rooms each have a TV, iron/ironing board and a hairdryer. In the main lobby there’s a 24-hour newsstand, and downstairs you can store your luggage and pick up any packages. Downstairs, off the main lobby you can have a bite to eat at Lindy’s Restaurant. Hotel Pennsylvania is located in Midtown Manhattan on 7th Avenue. A perfect location, as all of the famous sights of New York are nearby. The Empire State Building is around the corner, Macy’s department store is at about 50m away, and the hotel is right opposite Madison Square Garden; where the New York Knicks and Rangers play. It is also easily accessible from Penn Station, by either train or subway and Port Authority Bus Terminal is just a couple of blocks away.